Sometimes other drivers can make you crazy. Maybe you’ve gestured to boneheaded motorists, safe in the anonymity of your car and the flow of traffic. 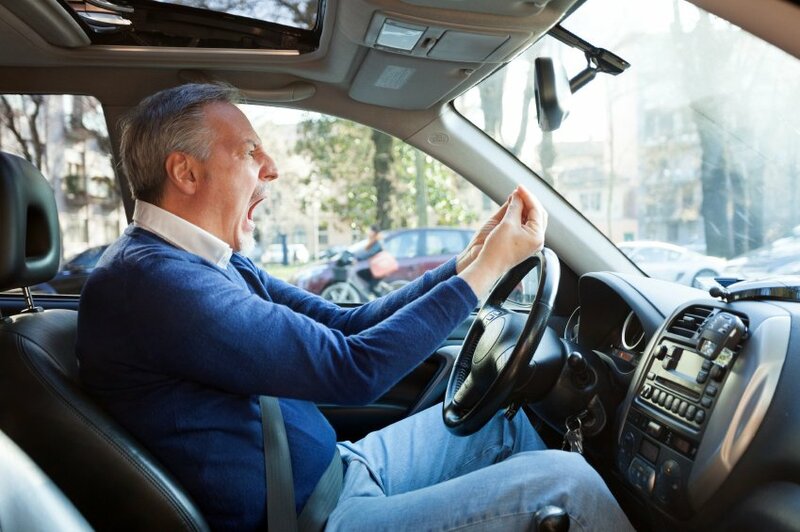 Perhaps you’ve let your anger at other drivers get the best of you at times because there’s no one else in the car to judge. But State Farm is on the case. It has developed plans to monitor your every move while you’re driving, measure your emotions, detect angry behavior and deliver stimuli such as music to calm you down. The plans, as revealed in a patent application, would combine biometric measurements with automotive data to create a “total impairment score” that could be used to set customized car insurance rates. The system could use “infrared optical brain imaging data” to get deeper inside your head. State Farm might even know if you’re giving the evil eye to another driver: Measurements include gaze direction and duration, eyelid opening and blink rate. And impaired driving is not confined to angry and aggressive drivers. State Farm also would consider nervousness, distraction and drowsiness. Other sensors would keep track of your vehicle: Are you swerving, accelerating or driving too close to other objects? If you are “emotionally impaired” – as measured by State Farm, not your spouse – the patent-pending system would select and deliver stimuli to change your behavior. The patent application outlines a variety of options, including relaxing music, a recorded message, sounds of nature, fragrance, or a blast of cold air. The system might even suggest you stop at a coffee shop or scenic overlook. Robert Nemerovski, a licensed clinical psychologist in the San Francisco area and an expert on anger management and road rage, was skeptical about State Farm’s patent. He questioned whether an automated system could be sophisticated enough to account for the unique characteristics of individual drivers. In addition, “People don’t want someone patronizing you or telling you to calm down. I’m not sure it would be successful psychologically because it would be rather annoying,” he says. 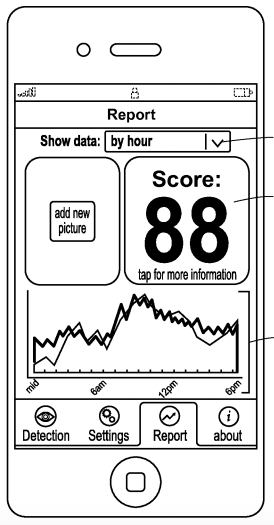 State Farm’s depiction of an emotional impairment score on a mobile device, from its patent application. State Farm envisions an “emotion management system” that goes beyond just monitoring behavior. The system would store profiles for each driver so, for example, it would learn which music might reduce your hard braking or persuade you to stop tailing the car in front of you. This might spell an end to your loud music. Each time you end a trip, the State Farm system would analyze the data and update your impairment score, which you could check on your mobile device. How much would it cost per vehicle? How often would you have to refill your fragrance containers? Angry about car insurance bills, too? Adjusting your insurance rate, up or down. Requiring you to buy a minimum amount of auto insurance, or limiting how much it will sell you. Offering you a discount for using the system. Flagging your policy for possible cancellation. 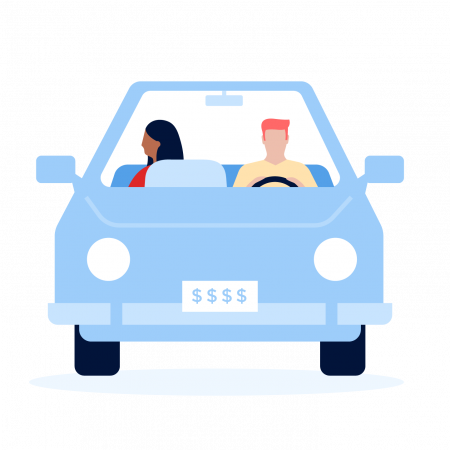 While State Farm’s plans may never be implemented, the carrier clearly has many ambitious ideas about monitoring customer behavior, such as its previously described ideas to price car insurance by the trip and deliver targeted ads based on where you drive. Many consumers aren’t aware that auto insurers are preparing to unleash a tsunami of such services based on telematics, systems that track your car and driving habits. Progressive was the first to enter the space and dominated it for a while with its Snapshot usage-based insurance program. “Other big auto insurers don’t want to be in second or third place again,” says Donald Light, director of North America property/casualty insurance for Celent, a research and consulting firm that focuses on information technology in financial services. Light sees one large hurdle to State Farm’s emotion-management plan: The company will have to convince state insurance regulators that the emotional impairment scores accurately reflect risk. “The key qualifier is that these kinds of data have to make actuarial significant difference in the ‘risk’ of different drivers,” Light says. For example, if State Farm wants to charge more based on driver agitation, the company will have to prove that agitation causes crashes. Nemerovski says State Farm’s emotional management system might appeal to millennials, who are comfortable with the idea of measuring physical and other metrics so they can be improved. “But I don’t think people would want it to be shoved down their throats,” he says.